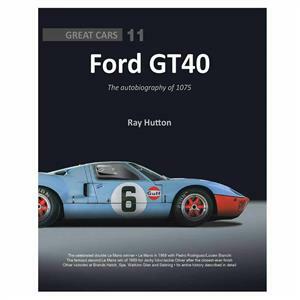 This sumptuous book tells the story of one of the world's most important racing cars. Always raced in Gulf's iconic blue-and- orange colours, this Ford GT40, known by its chassis number '1075', won the Le Mans 24 Hours not just once but twice, in 1968 and 1969, and the second victory came after the closest fight ever seen at the finish of this great endurance race. Four other championship wins - at Brands Hatch, Spa, Watkins Glen and Sebring - add to this GT40's distinction as the very best of its breed, driven by 'greats' such as Jacky Ickx, Pedro Rodriguez and Brian Redman. The car's entire competition life is covered in fascinating detail, together with biographies of its drivers and insights into John Wyer's crack team that ran it, all supported by a fine collection of period photographs. Ã²Early in 1968, after two non-finishes in Florida, at Daytona and Sebring, Jacky Ickx and Brian Redman overcame PorscheÃ†s challenge in the six-hour BOAC 500 at Brands Hatch. Ã²At the Spa 1,000Km in Belgium, torrential rain allowed Ickx to demonstrate his wet-weather mastery on his home circuit and take a second win for Ã¦1075Ã†, ably supported by Redman. Ã²Back in the USA, with Ickx now partnered by fellow Belgian Lucien Bianchi, Watkins Glen brought a third win amid controversy about team orders. Ã²With Ickx sidelined by injury, Mexican ace Pedro RodrÃ�guez was drafted in to join Bianchi at Le Mans Ã» and they won comfortably after PorscheÃ†s four-car works challenge collapsed. Ã²The second of three outings in 1969 saw a return to the Sebring 12 Hours and an unexpected success for Ickx and Jackie Oliver against formidable new opposition from Porsche, Alfa Romeo and Ferrari. Ã²And so to Le Mans again: in this old warhorseÃ†s final race Ickx and Oliver again achieved the unexpected by putting themselves in strong contention for victory Ã» but it was only decided on the last lap.